This notwithstanding, I claim that the Greek makes sense, and that Aristotle’s comparative logic is consistent. I defend this claim by looking at Aristotle’s use of negation. I suggest that there is linguistic evidence for maintaining that Aristotle introduces the property of trichotomy for comparative relations in Topics, 119 a20-22. 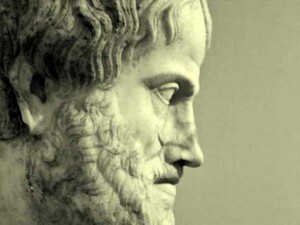 Aristotle’s comparative logic is thus sound, and has a property which has been neglected by commentators, who were misguided by the above translations. I will argue that a scholion preserved by the Paris ms. of the Topics goes hand in hand with my reading of the Greek text. I will also argue that it is possible to emend the text, in order to make it smoother (some words might be taken to have been added to the original text; the evidence for this is mostly Aristotle’s usus scribendi; as a consequence, I am cautious about the possibility of emending the text).